Membership forms and releases can be found on this Website - 'MEMBERSHIP INFO tab -Junior High Division' . Shelly Thompson; 4180 Rd 44 Yoder, WY 82244, (High school & Junior High secretary). $80 goes to national office $80 to the state. You must send a grade transcript with the membership forms. Membership forms/fees are due the Friday before the rodeo you want to enter. Please follow the entry information on the 'ONLINE' page; For dates and times check the information on this page. All Junior High entries will be handled the same way High School Entries are processed!​Please remember there will be NO LATE ENTRIES OR MEMBERSHIPS ACCEPTED. You must enter both days separately!!! 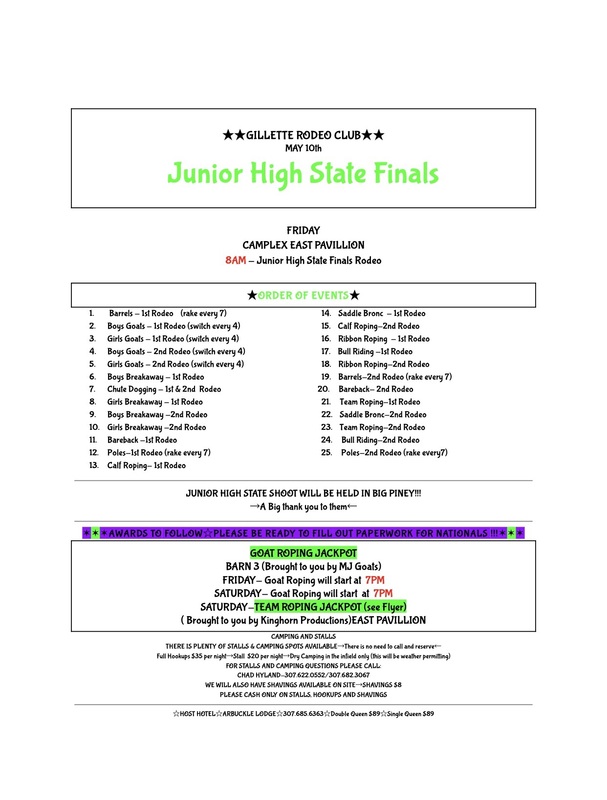 STATE FINALS ONLY- is a 1 rodeo/ 2 round event- when you enter (Gillette) you are entering the state finals and the fees posted are for the entire state finals!! Please call if you have questions! Programs posted on the website are un-official and subject to change. Contestants should check the order posted at the rodeo office for official position draws and official order of events! It is recommended that you print these daysheets and bring with you, as some local clubs will have limited number available at the rodeo! There will be a mandatory JH contestant meeting during the day on Friday! Points will be awarded for each go-round (10-9-8, etc,). YOU CANNOT ENTER ONLY ONE ROUND, so be aware that the entry fees posted are higher! All members wishing to send in Equine of the Year, Brownells shooting sports ambassador, or Student Athlete of the Year may do so now. Those forms may be found on the NHSRA website. More info will come this fall any questions please call Dixie Huxtable or JT Nunn.